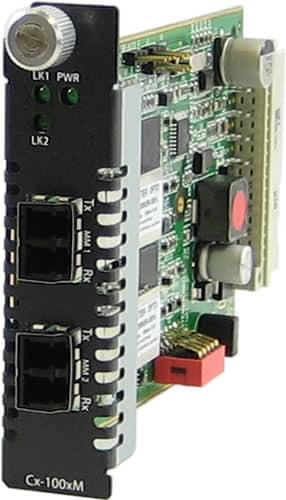 C-100MM-M2LC2 Fast Ethernet Fiber to Fiber Converter Module. 100BASE-FX 1310nm multimode (LC) [2 km/1.2 miles] to 100BASE-FX 1310nm multimode (LC) [2 km/1.2 miles]. A Fiber to Ethernet Media Converter designed to be installed in the MCR200 or MCR1900 Modular Chassis System. Transparent fiber extension of 100Base-FX multimode fiber to 100Base-FX multimode or 100Base-LX/EX/ZX/BX single mode fiber. For complete product details and technical specifications, please visit our C-100MM Fast Ethernet Fiber to Fiber Media Converter ModuleProduct Page.